Euro '96 - Do You Remember? Never mind the result: Euro ’96 was about the atmosphere. There was a buzz throughout the nation; the sun shone every day, pubs, streets and towns were overflowing with happy football fans who would good-naturedly banter with you as you walked past. The country was united; raised by the lion-like attitude of one of the best ever England teams playing at Wembley; for a while there was a real sense of ‘We can do this!’ which is something we haven’t really felt since. The St George flag seemingly waved from every house and shop that you passed and for a while there was a common uniform for English citizens; the England football top was worn proudly by every fan. You felt part of something; you could start a conversation with anybody you met about the game the night before, and complete strangers were hugging each other and declaring their love when Gazza knocked his 79th minute beauty past Scotland in the group stages. Now I realise that I may be looking back on the 1996 UEFA European Football Championship with my rose-tinted glasses on. I was 20, living in London and spent the whole tournament either in the pub, or in somebody’s back garden with a barbeque going and drinks being generously served. Maybe the weather wasn’t as good as I remember, maybe not everybody was my best mate and maybe for each person who lived and breathed nothing but glorious football for those three weeks there were countless others who groaned and buried their head every time the ‘Three Lions’ anthem was played on the television or radio. And even though the majority of games passed off peacefully and we finally managed to shake off our ‘hooligan’ tag, there were still isolated bouts of trouble across the country, including in Trafalgar Square, when England broke their fans’ hearts and bowed out of the competition. But let’s gloss over that and keep those glasses on for a bit, shall we? Let’s concentrate on the football - those magnificent matches where we allowed ourselves a tiny glimpse into a future where we would watch England’s then captain, Tony Adams, lifting that prized trophy aloft to the frenzied delight of Wembley’s crowd. The tournament began on Saturday 8 June. England opened with the first game of Group A – a slow affair against Switzerland which ended up 1-1 but gave Alan Shearer his first international goal for 12 games (he would go on to receive the tournament’s Golden Boot). It was our first point on the board. Then came that heart-soaring match against Scotland – where Gazza became the nation’s hero with his piece of solo football brilliance - and his ‘dentist’s chair’ goal celebration – and England fans’ hearts swelled with national pride. 2-0 and another three points. The Lion’s third group match was spectacular. Taking on the Netherlands the team powered four goals past their stunned opponents. Shearer slotted in a neat penalty in the first half, then Teddy Sheringham opened the second half with a second. Six minutes later Shearer scored again and with a neat symmetry, Sheringham got the fourth five minutes after that. Patrick Kluivert got a consolation goal in the 78th minute, which was enough to take the Netherlands through into the next round but it was England who finished top of the group. Seeing our team pumped full of justifiable confidence for the first of the knock-out games was a fantastic sight. The likes of Shearer, Sheringham, Seaman, McManaman, Gazza et al strode proudly onto the pitch in their England colours to take on a Spanish side who wanted the prize just as much as they did and gave us 120 nerve-biting minutes. Spain knew that they had to contain Shearer if they were to have any chance of progressing and contain him they did; the England striker had very few chances to break free. Despite some hard work in the second half there were no goals on either side and the match went into extra time. There were opportunities for a golden goal (the first goal scored would end – and therefore win - the game) but it didn’t happen so it was time for penalties. Still in pain for tumbling out of the semi-finals against West Germany in Italia ’90, England stepped up to the spot and showed the world that we actually could win a game this way. Shearer and Platt took the first two, finding the back of the net both times and then Pearce took his turn. Having missed in the 1990 tournament you could see from his approach that there was no way he was going to do it again. And he didn’t. Having scored his penalty deep into the right hand corner he turned emotionally to the ecstatic crowd and roared ‘Come on!’ (and other words to that effect that I can’t write here) and pumped the air with his fist. And we roared back; at that moment we were at one. With a final score of 4-2 to England the Lions marched on into the semi-finals. 2 more matches and that trophy – and a healthy dose of self-respect – would be ours. And who would we have to beat? Germany! More about that in a moment: this particular match triggers one of my favourite memories about this tournament. For the England v Germany game we went to a pub on the Archway Road, in north London. Draped in England flags inside and out, the pub was packed. Completely full of England fans. And one German fan. One very, very tall man in a German strip, standing right in the middle of the pub in front of the big screen. Everybody who squeezed into the room did a double take; why would this person want to spend 90 plus minutes surrounded by people who had a bit of a reputation for – well, not being very nice to their opposition?! This man was obviously very brave or completely oblivious to the fact that he was Germany’s sole supporter at that moment but he yelled and cheered in all the right places without ever acknowledging it. Thankfully, his viewing experience passed off peacefully and he even managed to leave the pub without the slightest hint of smugness which, let’s face it, under the circumstances he was perfectly entitled to do. Shearer, who by now just couldn’t stop scoring, headed the ball in after only three minutes. Oh yes, this was it! We were unstoppable! We were going to win the cup! Germany equalised on the 16th minute but the fans were in full flow now…’Come on England, come on England!’ Some strong play by both sides followed but no more goals in ordinary time – extra time and that golden goal beckoned again. If he had, if he’d got his foot to the ball – we’d have been in the final and our dream would have still been alive. As it was, there were no goals in extra time and here came the penalties once more. But we’d just beaten a team on penalties, hadn’t we? Surely our new-found momentum would get us through this one, wouldn’t it? Shearer took the first penalty. One nil. Germany equalised through Thomas Häßler. David Platt made it 2-1 before Thomas Strunz restored it to 2-2. Stuart Pearce gave us three, Stefan Reuter took it to 3-3. Gazza added the fourth and Christian Ziege drew Germany level again. 4-4. Wembley couldn’t have felt any tenser. And then, in a moment that will remain imprinted in England fans’ brains for evermore, Gareth Southgate walked slowly forward, to take England’s sixth penalty. He ran up, fired the ball low and left… and the keeper saved it with an outstretched hand. We crumpled. Andreas Moller took Germany’s sixth - scored – and suddenly the game was over. England were out. We all felt like Gareth Southgate looked: sick. So that was it. Germany met the Czech Republic in the final and beat them 2-1 with a golden goal in extra time. We went home, a strange mixture of sadness for not achieving the ultimate prize after coming so very close and pride for our courageous team and the best performance we’d seen in a long while. Seeing how well England had played together had given us hope – roll on the World Cup 1998! Do You Remember Euro '96? I was 17 and half way through my A-Levels at the time and wasn't quite into the pub football thing at that point and so watched most of the matches at home. I have watched a lot of football both live and on TV since but to this day I still think the England v Germany extra time period was the most tense period of any game i've ever seen. 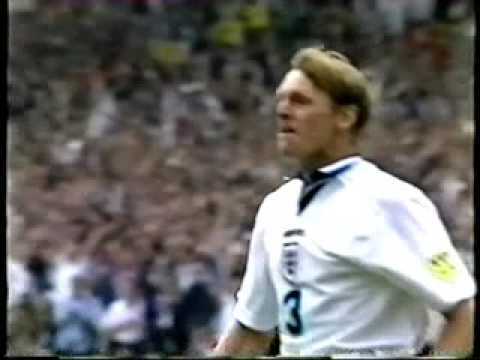 Golden goals were brand new at the time so when first Anderton hit the post, then Gazza slid and just missed a tap in and then when Germany scored a disallowed goal, I thought I was going to have a heart attack! Superb stuff. I remember Paul Gascoignes goal against Scotland, it was a baking hot Saturday afternoon and me and some mates were in the local pub, the atmosphere was electric anyway but once Seaman saved the penalty and moments later that goal being scored, it was a magical moment (unless your scottish). EURO 96 FOOTBALL PROGRAMME ENGLAND VS SWITZERLAND 8/6, 6 BIG NAMED AUTOGRAPHS.